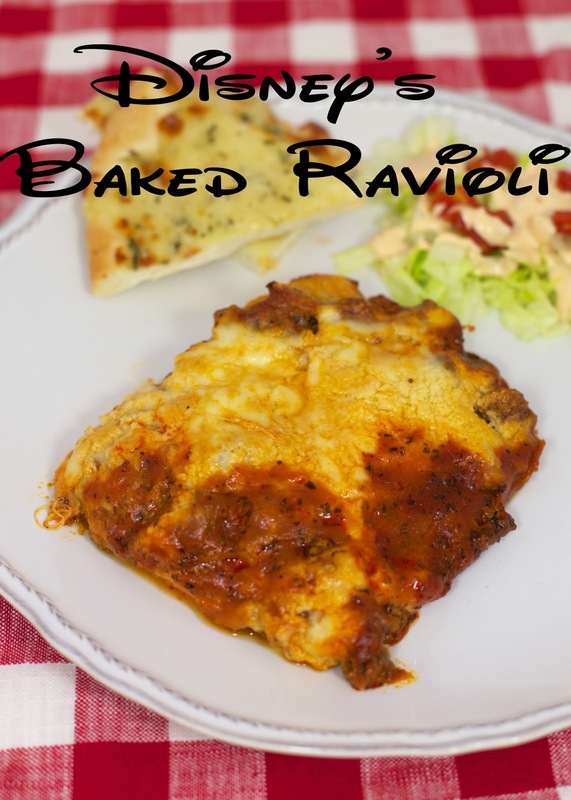 Disney's Baked Ravioli - Frozen ravioli smothered with a homemade meat sauce. Recipe from the Epcot Food and Wine Festival - the sauce is amazing! Tastes better than any restaurant! Can make ahead and freeze for later. We originally had this dish at the Epcot Food and Wine Festival this past Fall. It was one of the most popular dishes at the festival. They actually sold out while we were in line, and we had to wait about 10 minutes for more. It was definitely worth the wait. It was SO good. I couldn't wait to make this at home! This was incredibly delicious. 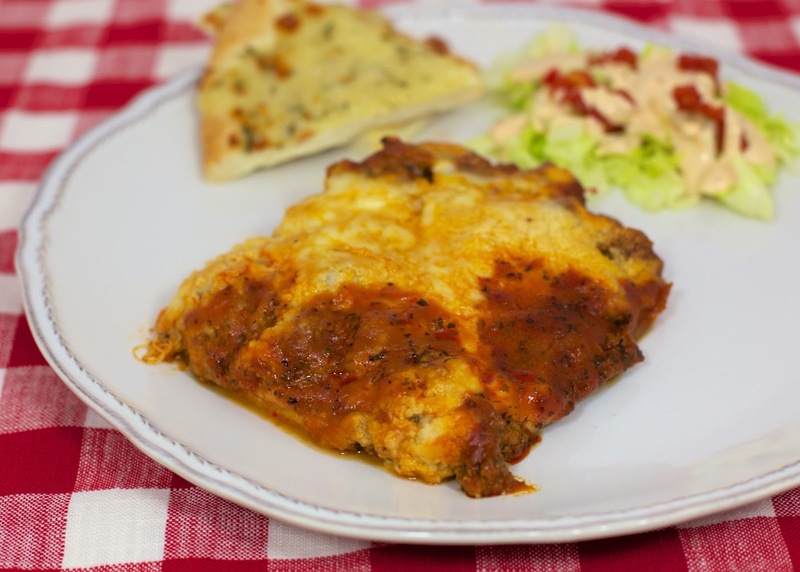 The sauce is the star of this dish (and all that yummy baked cheese on top). The sauce is easy to make. The hardest part is waiting on it to simmer for an hour! I only made one small change to the original recipe. I used a can of petite diced tomatoes instead of dicing two tomatoes on my own. I will definitely be making this again and again. The sauce is my new "go-to" sauce. You can assemble ahead of time and bake later or even freeze it. Make this for your sweetie for Valentine's Day. They will thank you! Heat olive oil in large skillet or pot over medium-high heat. Add sausage and ground beef, breaking up with a wooden spoon, until meat starts to brown. Add garlic and onion, stirring occasionally, until meat is cooked through. Stir in tomatoes, tomato sauce and tomato paste. Bring to a simmer. Stir in basil, oregano, garlic powder, salt, pepper and red wine or beef stock. Cover and simmer for 1 hour. Preheat oven to 375ºF. In bottom on 9x13-inch pan, pour 2 cups of sauce. Cover with layer of ravioli. Pour remaining sauce on top. Sprinkle with cheeses. Bake 30 minutes, or until cheese is melted and golden. The ingredients sure sound right for a delicious lasagna. Making this for dinner tonight :) Thanks for all the recipes Steph! Do you prefer using red wine or beef stock? I used beef stock because that is what I had on hand. If you use red wine, use one that you enjoy to drink. It will flavor the sauce. Can You post the link to the original recipe or where you found this recipe? Are the dried basil and oregano in this - dried basil and oregano leaves? I have the crushed up seasoning versions and just don't want to use too much. Also, the dried garlic...is that the same as garlic powder? Don't want to go overboard... thank you! I used the regular crushed dried oregano, basil and garlic powder. What you have is exactly what I used. Enjoy! Just want to make sure this is correct....You used 2 cloves of fresh garlic and 2 Tablespoons of dried garlic?? Should that be dried onions maybe? Sounds like an awful lot of garlic. You can adjust the garlic to your personal taste. Will definitely give this a try. I just tried the store bought ravoli and I was impressed how good it was!!! Can't wait to try this. Looks yummy!!!!! !